Industrial Oil Crops presents the latest information on important products derived from seed and other plant oils, their quality, the potential environmental benefit, and the latest trends in industrial uses. This book provides a comprehensive view of key oil crops that provide products used for fuel, surfactants, paints and coatings, lubricants, high-value polymers, safe plasticizers and numerous other products, all of which compete effectively with petroleum-derived products for quality and cost. Specific products derived from oil crops are a principle concern, and other fundamental aspects of developing oil crops for industrial uses are also covered. These include improvement through traditional breeding, and molecular, tissue culture and genetic engineering contributions to breeding, as well as practical aspects of what is needed to bring a new or altered crop to market. As such, this book provides a handbook for developing products from renewable resources that can replace those currently derived from petroleum. 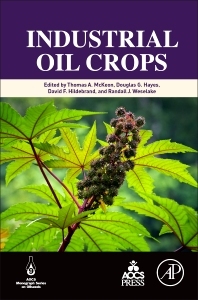 Led by an international team of expert editors, this book will be a valuable asset for those in product research and development as well as basic plant research related to oil crops. What Is an Industrial Oil Crop? Why Do We Care About Industrial Seed Oils? Where Do Industrial Oils Come From? How Are Industrial Oil Crops Improved? Dr Tom McKeon is a research chemist with the USDA Agricultural Research Service at the Western Regional Research Center in Albany, CA. He received his PhD in biochemistry from the University of California, Berkeley. His research area is the biochemistry of castor oil biosynthesis and he is involved in aspects of agronomy, toxin detection and chemurgy of castor to promote its reintroduction as a US crop. Dr McKeon is active as a member and biotechnology division Board member of the American Oil Chemists' Society (AOCS) and served on the AOCS Governing Board and numerous committees. He serves as a co-organizer of the USDA-ARS sponsored US-Japan Natural Resources (UJNR) Food and Agriculture Panel. He is also a Board member of the International Society for Biocatalysis and Agricultural Biotechnology, has served as Guest Editor for the ISBAB special issues of New Biotechnology and as Editor of Biocatalysis and Agricultural Biotechnology (BAB) published by Elsevier. Douglas G. Hayes is a professor of biosystems engineering at the University of Tennessee. Professor Hayes has previously served as a faculty member in the Department of Chemical and Materials Engineering at the University of Alabama in Huntsville. He also hold an Adjunct professorship in the University of Tennessee Department of Chemical and Biomolecular engineering, guest professorships at Wuhan Polytechnic University and Jinan University in China, and is a UT-Oak Ridge National Laboratory Joint Faculty. Professor Hayes is a Senior Associate Editor (SAE) for the Journal of the American Oil Chemists’ Society and an AE for Journal of Surfactants and Detergents. He has served the American Oil Chemists’ Society (AOCS) as an officer for the Biotechnology Division (Chair from 2014 to 2015), was Chair of the AOCS Professional Educator Common Interest Group (2013–18) and is a member at large for the AOCS Governing Board (since 2017). He has published over 65 articles in peer-reviewed publications, 15 book chapters, and one edited book. His research interests include surfactants, soft matter, and biobased chemicals and materials. Dr. David Hildebrand is Professor in the Department of Plan and Soil Sciences at the University of Kentucky. He earned his PhD in Plant Breeding and Genetics from the University of Illinois. His research interests are in plant biochemistry and genetics and the application of biotechnology to crop improvement with particular emphasis on food, lipid, and oil quality, new uses of agricultural commodities, and plant pest defense. He has served as Associate Editor for the Journal of American Oil Chemists' Society since 1999 and as Associate Editor of Biocatalysis and Agricultural Biotechnology since 2009. He holds five patents and is the author of more than 150 peer-reviewed publications. Randall J. Weselake is a professor and Tier I Canada Research Chair in Agricultural Lipid Biotechnology in the Department of Agricultural, Food and Nutritional Science at the University of Alberta (Edmonton, Alberta, Canada). Since 1987, when he was a research associate at the National Research Council of Canada in Saskatoon, Randall’s research has focused on the biochemistry and molecular biology of storage lipid metabolism in Brassica napus and other oil crops. Recently, he served as scientific director of the Alberta Innovates Phytola Center, which specializes in oilseed innovations, including research on the development of industrial oil crops. From 2007 to 2013, Randall was leader of the “Bioactive Oils Program” funded by AVAC Ltd., and from 2006 to 2011, he was co-leader of the Genome Canada/Genome Alberta project “Designing Oilseeds for Tomorrow’s Markets”. From 1989 to 2004, Randall was with the Department of Chemistry and Biochemistry at the University of Lethbridge (Alberta, Canada), serving as chair from 1996 to 1999. His doctoral research in plant biochemistry was conducted at the University of Manitoba and Grain Research Laboratory of the Canadian Grain Commission. Randall is joint editorin-chief of the American Oil Chemists’ Society (AOCS) Lipid Library, associate editor for Lipids, and editor for Biocatalysis and Agricultural Biotechnology. Randall has published more than 160 papers in refereed journals and books and is editor of the book Teaching Innovations in Lipid Science, which was published by the Taylor & Francis Group of the CRC Press and the AOCS Press. He is a fellow of both the AOCS and the International Society of Biocatalysis and Agricultural Biotechnology.